Every year I coordinate a ski trip for a group of 5-6 old high school friends. We are all nearly 50 years old, each with different expectations for where we stay. Some prefer "bigger", some require "location, location", others want "cheap". Needless to say planning can be a bit of a challenge. This year I picked Telluride and selected LuLu 3G as our "place". Having rented many properties in various ski towns, I have never been greeted by the property managers. Will met us as our shuttle pulled up and kindly took us through the property and gave us the scoop on what was great around town. Not only was the condo nice and represented accurately online, the location was by far better than we expected. This place is nearly ski-in, ski-out with only a short walk across the bridge! Having Clarks market so close was also a fantastic perk. Needless to say we were all very happy with our stay. Not only would we return, we would happy recommend Latitude 38 to any of our family and friends. Telluride is a beautiful place and you guys represent it very well. Thanks and have a great 2019! Everything about our stay in the Lorian Luxury unit 2 and our experience with Latitude 38 was FABULOUS! We would come back to you first again for rental property hands down! The property was beyond our expectations what a treat. So clean and furnishings all top of the line. Super comfortable beds and that is always important to us. Loved the little touches like Mrs. Meyer's hand soap and the yummy smelling bath and lotion products. Will was great explaining the place to us when we arrived and giving us some recommendations for restaurants in MV since we've always stayed in Telluride. We do rental properties at least twice a year so have a lot of experience with good and not so good and this was definitely one of our 2 favorites ever! The other is in Chatham, MA so no contest in Telluride/MV! We've stayed in some places that screamed the owner doesn't care about their renters so we really love that Latitude and the owners are so in tune to welcoming the renter into their home. Sorry to carry on but last year we rented a place down in Telluride for twice what we paid for Lorian and oh my gosh furniture was torn up, registers falling off the wall, rickety metal bunk beds that our college boys had to sleep in, bathrooms in dire need of remodel...all the rental company had to say was "well it's a good location". Needless to say, we will never rent from that company again. You all are really on the ball and have the right package together! Just awesome! everything excellent, we love it we will be back soon!! Beautiful ski in/ski out home with wonderful views. Loved the warm decor. Perfect set-up for kids with bunk room and billiards room located on bottom floor along with hot tub. Loved having a garage too. We loved it! The space heater issue was minor but of course inconvenient. The property was well maintained and well stocked. Close to the grocery and a walk to town/lifts/free gondola makes for a great location! On-site laundry was key. Beds were comfortable and the living area very cozy. Can't wait to return!! It's beautiful property. Very clean and comfortable. It had everything we needed to have a wonderful stay. Excellent location. BLOWN AWAY! The beauty of this home exceeds whats captured in the fantastic photos. Honestly, I wondered if the view from the dining room was a bit touched up. To our delight, it is even better in person. Also, the place is HUGE inside and the added touches were well thought out - Bluetooth speakers in every room! The Latitude team were real pros from start to finish. We can not think of one thing they can do to improve. The luxury soap, shampoo and lotion was very much appreciated. Our boys loved the stainless water bottles and sunglasses. We will definitely book again soon! Thank you so much for offering this wonderful property. It made our holiday truly special. It was also a pleasure dealing with the Latitude 38 staff. Property was in the perfect location right by the lift downtown. Clean, spacious and modern! Would not hesitate to book again. Great location. Perfect set up. 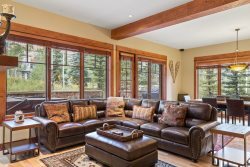 We've stayed at multiple VRBOs in Telluride and this one had all the features we wanted from bedrooms, ski in ski out, and a great mudroom for our gear. Very well located, steps from chairlifts to the mountain and gondolas to Telluride and Mountain Village market. Cleaning and decoration are perfect. We stayed in Ajax C for the second time this year and consider it our "home away from home:. I am an Interior Decorator by profession and completely appreciate all the beautiful furnishings in this home. The staff was absolutely wonderful. So helpful and accommodating. Everyone really went above and beyond. The condo was beautiful. Everything you could ask for. Right on the slope. We appreciated the excellent communication prior to our arrival. We received great help with directions, lift tickets and late arrival instructions. Absolutely loved the location, appreciated the underground parking. The unit itself was gorgeous, immaculately clean and stocked with everything we needed. We used the fireplace often and loved the comfy beds, the the luxury toiletries were a nice touch. We were delighted to discover the added convenience of the Clubhouse on the mountain. Outside one of our windows was a streetlamp wrapped in fresh greenery, tied with red ribbon and with a thick cap of snow resting on the top. We loved the friendly glow in the evening and while enjoying early morning coffee. It would wink off at the first light of morning, a signal it was time to get ourselves up and out to enjoy another glorious day in Telluride.